Tweet Hustlin': Nicki Minaj & Her Fans Tweets About Her Kiss With Madonna! Nicki Minaj had a very special moment while shooting for her collabrative song with Madonna and M.I.A. 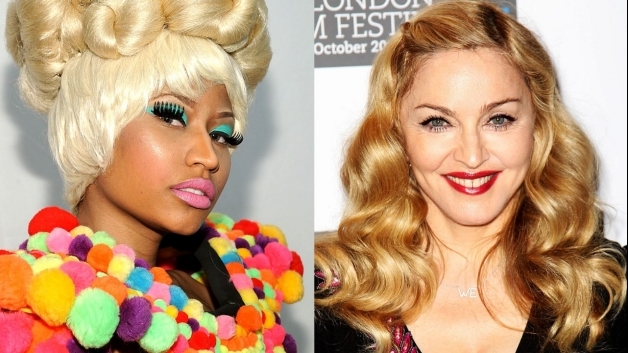 Check out what Nicki Minaj and her fans had to say about her kiss with Madonna. OH MY f'ingggg Gahhhh!!!!! MADONNA jus kissed me!!!!! On the lips!!!!!!! It felt sooooo good. Soooo soft!!!! *passes out* aaahhhhh!!!!!!!!! No barbz...like...seriously...it felt soooooooooo good!!!!!!! Sooooo soft! Like what?!?!?! bwahahahhahahahahahaha!!!! I was shocked but kissed back!!!ahhh! > RT @MzBellaBarbie: @NICKIMINAJ how did u react when she kissed you? Shocked? Spazzed? Kissed back? It was more romantic. Bwaha! > RT @ItsMarthaBitch: @NICKIMINAJ was it like the Madonna/Britney kiss or did y'all make your own HERstory?